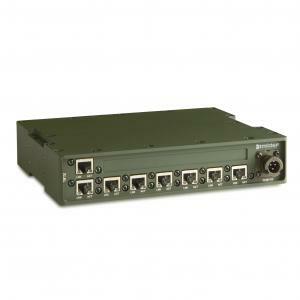 The 19”/2 8-p Switch PoE ESW301 gives you eight high performance Power over Ethernet ports. There’s no need to configure the Switch before use – simply plug in your cables and you’ll have power and data streaming instantly. The switch conforms to the IEEE802.3af standard for smooth integration with other PoE devices. With a rugged case that has a protection rating of IP54 against rain and dust, you can count on long-term performance in any environment. Our products always come with lifetime support to ensure your equipment maintains peak performance for many missions to come. We alsso erve units and stock spare parts for 5 years after end-of-life.